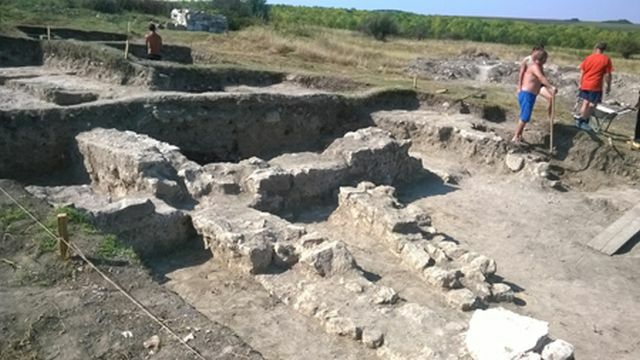 Archaeologists from France and Canada have visited their colleagues from the Dobrich Regional Museum of History in the second annual excavations of the large Late Roman and Early Byzantine fortress Zaldapa built on top of an Ancient Thracian settlement near the town of Abrit in Northeast Bulgaria. The Bulgarian archaeologists have been visited by two Ph.D. students of Prof. Pascale Chevalier from the University of Clermont-Ferrand, as well as by Assoc. Prof. Dominic Moreau from the University of Lille and Prof. Nicolas Beaudry from Canada, reports the Bulgarian state news agency BTA, citing Yoto Yotov, an archaeologist from the Dobrich Regional Museum of History. All of the foreign archaeologists working on Zaldapa specialize in the period of the Late Antiquity. Their goal is collect information about Zaldapa and other archaeological sites from the same period in order to be able to seek funding for bringing international students for excavation training. Their educational activities at Zaldapa and other Bulgarian archaeological sites can materialize in 2017 at the earliest. The 2015 summer excavations of Zaldapa are only the second proper digs at the Ancient Thracian and Roman city, after the excavations in 2014. Zaldapa was first explored a century ago by the Czech-Bulgarian brothers Karel and Hermann Skorpil, who are the founders of modern-day Bulgarian archaeology. Between World War I and World War II, when the region of Southern Dobrudzha was part of Romania, Zaldapa was also researched by Romanian archaeologists any findings they might have had have not made it to the Bulgarian archaeologists. Zaldapa has become famous as an archaeological site in the recent decades thanks to the research of Assoc. Prof. Sergey Torbatov from the National Institute and Museum of Archaeology. Dobrich archaeologist Yoto Yotov says in the past 20-25 years the ruins of Zaldapa have been ruthlessly raided by treasure hunters – a crime said to have been stopped as a result of the first proper archaeological excavations of the Thracian and Roman fortress which took place in 2015. The 2015 summer excavations of Zaldapa have started in early July with a total funding of BGN 18,000 (app. EUR 9,200). Of those BGN 8,000 (app. EUR 4,100) have been provided by the Bulgarian Ministry of Culture, and BGN 10,000 (app. EUR 5,100) – by Krushari Municipaliy, where the robust Roman and Byzantine fotress is located. In their work, the archaeologists are aided by 7 workers. The researchers are continuing the excavation of an early Christian bishop’s basilica found in Zaldapa last summer together with over 400 coins, crosses, cult artifacts, and marble fragments, and are said to be hoping to discover the bishop’s residence. The Ancient Thracian, Ancient Roman, and Early Byzantine fortress Zaldapa located between the towns of Abrit and Dobrin, Dobrich District, Northeast Bulgaria, is said to be the largest fortified settlement in the geographic region of Dobrudzha (covering much of Northeast Bulgaria). Because of the name of the town of Abrit, for a long time, in the 19th and the first half of the 20th century, the Bulgarian archaeologists and historians thought the Zaldapa Fortress was in fact the legendary ancient city of Abritus – until the ruins of Abritus were discovered some 100 km to the southwest, near the city of Razgrad, in 1953. Zaldapa (meaning “yellow water") was originally an Ancient Thracian settlement founded in the 8th century BC. It is located on a large peninsula-shaped plateau with a length of 1.2 km and a width of 500 meters (totaling 0.6 square km). Archaeological observations indicate that Zaldapa was densely built-up and populated. The entire settlement covered an area of 35 hectares (app. 86 acres). Zaldapa’s fortress wall appears homogenous meaning it was probably constructed in a single campaign, without major reconstructions in subsequent periods. It has a lot of straight sections as well as a total of 32 fortress towers of various shape and size, as well as 3 main and 2 smaller gates. The type of the fortification indicates that it was built in the Late Antiquity, i.e. the Late Roman period, most probably in the second half of the 4th century AD. Zaldapa was first explored in 1906-1910 by Czech-Bulgarian archaeologist Karel Skorpil, one of the founders of modern-day Bulgarian archaeology. Later archaeological exploration has been reduced to terrain observations. Between World War I and World War II, when the region of Southern Dobrudzha was part of Romania, Zaldapa was also researched by Romanian archaeologists any findings they might have had have not made it to the Bulgarian archaeologists. Proper archaeological excavations at Zaldapa were carried out for the first time in 2014 by archaeologists from the Silistra Regional Museum of History, the Dobrich Regional Museum of History, and the Varna Museum of Archaeology (Varna Regional Museum of History). Unfortunately, since the end of the 19th century the Ancient Thracian and Roman city of Zaldapa has been targeted by looters and treasure hunters. All archaeological explorations there to date have studied part of the fortifications, a Roman civic basilica, an Early Christian basilica, and a huge water reservoir. The so called Roman civic basilica was explored by Czech-Bulgarian archaeologist Karel Skorpil in the first decade of the 20th century. It is located in the center of Zaldapa, and has dimensions of 101 by 18 meters. Its walls are constructed according to the Roman style opus implectum, and its floor is tiled with bricks. According to Bulgarian archaeologist Assoc. Prof. Sergey Torbatov from the National Institute and Museum of Archaeology, the basilica was probably an entire architectural complex consisting of two basilicas with a common entryway; it was a Roman public building with judicial and commercial functions. In 1906, Karel Skorpil also explored an Early Christian church, a three-nave, one-apse basilica with dimensions 27 meters by 16 meters, situation in the east-west direction. It was built in the same style as the fortress wall and the civic basilica, most probably at the end of the 5th and the beginning of the 6th century AD, during the reign of Byzantine Emperor Anastasius I Dicorus (r. 491-518 AD). A bishop’s basilica was discovered at Zaldapa in the first regular excavations in 2014 by archaeologists from the Silistra Regional Museum of History, the Dobrich Regional Museum of History, and the Varna Museum of Archaeology (Varna Regional Museum of History) led by Prof. Georgi Atanasov and Prof. Valeri Yotov. The water reservoir of the Zaldapa fortress was discovered in 1949 by Bulgarian archaeologist M. Mirchev. It is located northwest of the fortress itself. It was a rather complex engineering facility consisting of two spaces. The water reservoir was connected with the fortress with a secret passage, a rock tunnel which is 3 meters wide and 3 meters tall. The Bulgarian archaeologists believed that because of its vulnerable location outside the fortress wall and the secret passage, it was covered with earth immediately after its construction to hide it from the enemy forces. The water reservoir was likely constructed in the second quarter of the 4th century AD together with other Late Roman urban infrastructure in the city of Zaldapa. According to the works of 7th century AD Byzantine chronicler John of Antioch, the city of Zaldapa was the birthplace of Byzantine general Vitalian (d. 520) who led a rebellion against Byzantine Emperor Anastasius which grew into a 5-year civil war. The city of Zaldapa is also found in the list of fortifications renovated during the reign of Byzantine Emperor Justinian I the Great (r. 527-565 AD) where it was also mentioned as the seat of a Christian bishop under the diocese of the metropolitan in Tomis (today’s Constanta in Romania). The fortress of Zaldapa was in use by the Later Roman Empire and Early Byzantine Empire (i.e. the Eastern Roman Empire) for about 250 years – between the second half of the 4th century AD, and the end of the 6th century AD when the city of Zaldapa was depopulated as a result of the great barbarian invasion of the Avars in 585 AD.